Recently, Iran unveiled its advanced domestically-manufactured tank named Karrar. The tank has already hit mass production. Military expert Vladimir Bogatyrev underscored the semblance of the newest Iranian tank to Russian tanks. On Sunday, the Iranian Defense Minister announced that mass production of the Karrar tank has kicked off, according to Iranian media. An official statement was made after the tank was presented at the Organization of Defense Industry. "The tank can compete with the most advanced tanks in the world in three main areas: power, precision and mobility, as well as maintenance and durability on the battleground… The Karrar has the capability to fire missiles and precisely guide them [towards the target]," Defense Minister Brig. Gen. Hossein Dehqan said at the presentation. 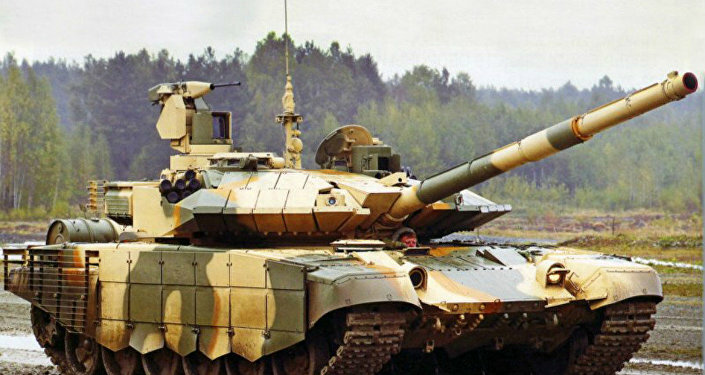 It is no coincidence that specialists regard the Karrar as some kind of a copy of the Russian-made T-90SM, the most advanced modification of the T-90 platform, according to retired Maj. Gen. Vladimir Bogatyrev, chair of the Board of the Russian National Association of Retired Military Officers. "Initially, Iran planned to buy Russian T-90SM tanks, and there were several meetings between Russian and Iranian delegations. But finally the Iranian defense minister said that Tehran would develop own tanks. Its technical specifications are kept secret," Bogatyrev told Radio Sputnik. According to him, there are certain details indicating that the newest Karrar tank is similar to Russian-made tanks. "For a long time, the Russian T-72 was the main battle tanks with the Iranian military. Currently, they still have some 500 units in service. The Zulfiqar 3 tank was very similar to the latest versions of the T-72 and the T-90, including its gun, transmission and engine. It has similar targeting systems, including laser. The Iranian tank is also capable of firing anti-tank guided shells," the expert said. Moreover, in addition to Russian tanks, the Karrar also compiles notable details of certain Western-made armored machines. "It is based on the T-72 platform, but it also has something from the American Abrams and M-60 tanks. Some elements are borrowed from the M-48 and the British Chieftain tank. They took all these elements and tried to design their own tank," Bogatyrev pointed out. The expert suggested that in terms of certain military capabilities the Karrar is unlikely to match the Russian T-90. "There is no decades-long tradition of tanks-manufacturing in Iran. So, there can be no breakthrough technologies. I’m not sure that the Karrar is close to the T-90 in certain points, from its armor to some specific features," he said. However, Bogatyrev highly appreciated the capabilities of the Iranian defense industry. "The production of tanks and anti-aircraft systems is well-developed in Iran. They are also trying to develop other types of weapons. In the terms of the defense industry, Iran should not be underestimated," the expert concluded.